When is your next book going to be published? I do not know! I am trying for late 2018 or early 2019! Why haven't you published a book in a long time? I am so sorry for taking so long to write another book. I have had TWO babies in 2.5 years. I have been swamped with mom life and it's been very challening at times. Now, in August of 2018, I am starting to work again. What book are you writing next? I have flip-flopped on this question worse than John Kerry. (My apologies for the awful political joke, but it made me giggle). 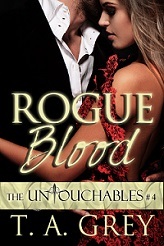 I plan, however, to write The Untouchables Book #5 next - Kane Gunner and Tabitha Burke's book! I hope that pleases some of you Untouchables fans! What ever happened to Gio (Bodyguards for Hire #2)? This book has been so difficult for me to write. Mostly that has to do with becoming a firs-time mother. I have had two children in a short period of time so things have been hard to change for me. That means I've written some of this book but it keeps going stale for me--meaning I can't finish it. I *hope* to write this book one day; however, for now I hope you wonderful, beautiful readers try one of the my other series (which are completed!). Thank you so much for your patience. I love you all! My books are available for pre-order through Amazon, Smashwords, Nook, iTunes, and Google Play when I have a new release. Check your favorite online retailer to see if my books are available to pre-order. Where can I learn about your latest books? Sign up for my newsletter or follow me on Facebook to see my latest announcements, read sneak peeks, see book cover reveals, and more. I personally respond to Facebook messages, Tweets, and emails. Feel free to Friend me on Facebook, Like my author page, or send me emails when you have a question, problem, or comment. I usually answer pretty quickly and I love to hear from readers! 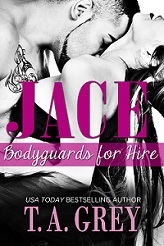 In 2016 I'm writing Rogue Blood, The Untouchables #4 and Caught, The second book the Claiming Series. Yes! Gio and Tara's book is next in the series. Look for it in 2017. 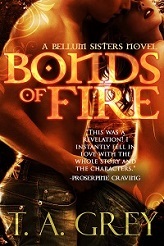 Will there be another Bellum Sisters book? Expect some more. Aidan, the mysterious vampire in the rift, will be getting his own story. Certain other characters may also get a story. We'll see! Will there be any more Kategan Alphas books? If you're looking for a Kategan Alphas fix, check out A Kategan Alphas Christmas Special featuring the whole family. The spin-off series here. Check out The MacKellen Alphas to get your fix of my alpha lykaens. Will there be another Mackellan Alphas book? To find my e-books you go to the Purchase page then select where you'd like to buy from. You can buy from many different stores such as Amazon, Barnes & Noble, All Romance ebooks, Smashwords and iTunes. What if I don't have an e-reader? To clarify since some people have asked me. You can read ebooks on your computer! A tablet is an e-reader. You do not have to own a Kindle Fire or Nook, for instance to read ebooks. I just recently bought a tablet and I've been reading ebooks for years! To read them on your computer, simply download the free Amazon Kindle App or the Barnes and Noble Nook App below, then you can purchase books through their store and read them on your computer or phone. The Nook and Amazon app both have different options. It has a download for your iphone, ipad, or even Mac computer as well. -Find the Kindle App for PC. -Find the Nook App for PC. I use several different and very talented designers. Learn more about them here. I now have several editors and a proofreader. To learn more about them click here. Just send me an email or ask me on Facebook and I'll add it!